During his scientific expedition to North America in 1832-1834, Prinz Maximilian zu Wied-Neuwied was often called "Prince Max," and even now, zoologists sometimes use this nickname. Among the amphibians and reptiles first described for science by Prince Max were two frogs and a turtle. On page 249 of book cited below, Prince Max described Hyla triseriata Wied. Later, as is often the case with species named long ago, the species was assigned to a different genus; the current name is Pseudacris triseriata (Wied). 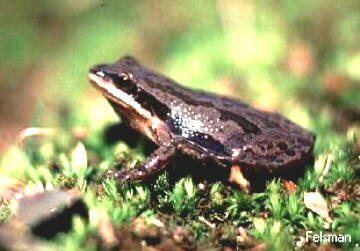 The common name is western chorus frog. Prince Max's description occurs as a note at the end of Chapter IX, entitled "Journey from New Harmony to St. Louis on the Mississippi, and Our Stay There, from March 16th to April 9th, 1833. The fact that the note does not occur at the end of the preceding chapter, on "Description of the Country about New Harmony, in Indiana, and Winter Residence there from October 19th, 1832, to March 16th, 1833," suggests that Prince Max's type specimen of the western chorus frog was not, as has been suggested elsewhere, taken from Rush Creek, about 4 miles south of New Harmony. I thank Ken Felsman for permission to use this image; a link to his gallery of photographs is provided below. In the same book, on page 275, Prince Max describes Hyla crucifer, of which the binomial+author taxon is currently Pseudacris crucifer (Wied). 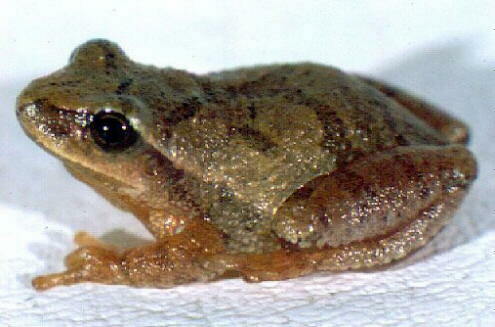 The common name is spring peeper. I thank Celia Clark of Digital Frog International for permission to use this image; see the link below. Here you see Trachemys scripta elegans (Wied), commonly known as the red-eared slider. This well-known turtle is often kept as a pet. Prince Max gave it the name Emys elegans, when he wrote (page 213), "Man könnte diese Art Emys elegans nennen, da sie durch überaus nette Zeichnung charakterisirt ist." Maximilian Prinz zu Wied, Reise in das Innere Nord-America in den Jahren 1832 bis 1834, two volumes, J. Hoelscher, Coblenz, 1839. The descriptions of species are given at the ends of chapters in the German; the translations I have seen omit these end-of-chapter notes.